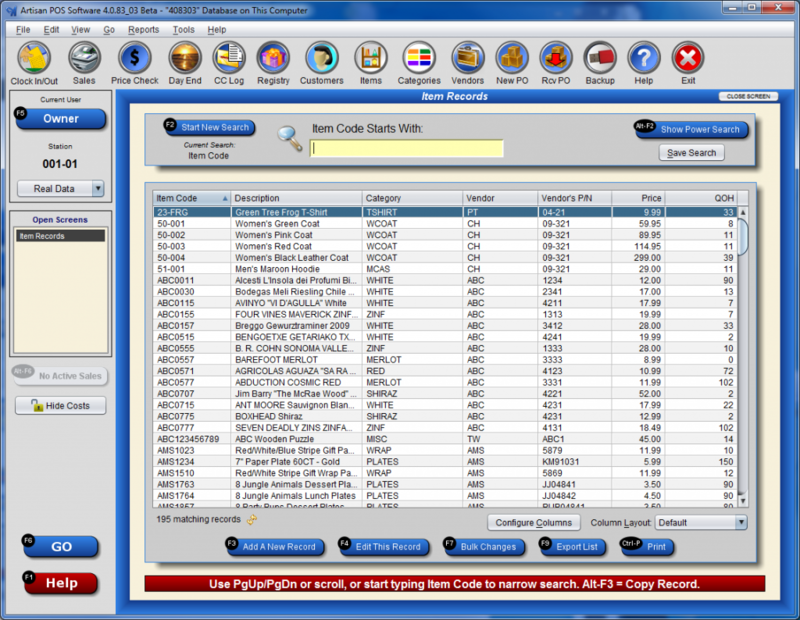 The Record Screen is a powerful tool used to view, select, and edit a filtered list of records such as Item Records, Category Records, Vendor Records, just to name a few. The record screen is used throughout Artisan and does have some variations, but all have a common theme. We will be using the Item Records Screen for our example. The record with the highlighted background (shown in blue) is the selected record. Pressing ENTER will perform the default action for the particular screen on the highlighted record. When you are just in a basic record list, such as Item Records then pressing ENTER will edit the record. But if you are in a record screen that is asking for you to make a selection, ENTER will select the record. For example, in the sales screen, the customer prompt will select the customer, but in the customer records screen, it will edit the customer record. Note – In all of Artisan, F2 is always associated with searching, F3 is always adding a new record, and F4 is always editing. This includes any variation such as Alt-F3 or Alt-F2, etc. If you press F4 or select Edit This Record, the record that is highlighted will be opened. If you press Alt-F3 to copy this record, then the highlighted record will be copied into a new record. To create a blank new record using only the built-in and user defined record defaults, press F3 or the Add a New Record Button. To copy a record use Alt-F3. In the top left corner of the search filter box, you see F2 Search Scheme button. This is the primary way of changing your search. The search scheme saves both your filter field and sort order field, which are not necessarily the same. When you first switch to a new search scheme, they will start out the same. When you select a new search scheme Artisan makes sure that field you select is included as one of your field columns. Click on a field column header to change the order. Click again to toggle between ascending and descending order. The small blue triangle points up for an ascending (A to Z) sort order. The arrow pointing down means the records are sorted in a descending (Z to A) order. To add or remove field columns or to rearrange them, right click or choose the Configure Columns button to add or remove field columns from your view. If you add more columns the screen may horizontally scroll or you may re-size your window to allow for more room. Another way to rearrange columns is to click the field header and drag it where you want it to go. The search box at the top of the screen allows you to filter your searches depending on the option you have selected. Use F2 or click on the Start New Search button to change the search criteria. The Show Power Search button is used to reveal an additional set of record filters customized for each record type. Therefore, no two record types have the same options. The power search is broken up in 2 or 3 tabs depending on the record type. For more detail on using the Power Search Feature please read Using the Power Search Feature article. Once the power search is visible, you can hide it without interrupting the filter to allow you to see more of the filtered records. Click on the red X, to clear the filter or press Show Power Search to reveal the filters again. If you need to change more than one record at the same time, such as a price change for an entire category, then you would want to use Bulk Changes. Bulk Changes are specific to each of these record types: Item Records, Category Records, Vendor Records, Customer Records. This feature is not yet implemented at the time of the writing of this article. If you want to print out a list of records or print out a page on each record, then press Ctrl-P or choose this button. You will be given various general printing options, but the report will be sent to the printer you have set as your report printer.